Remember my story from last month when I shared how much Mike and I LOVE factory tours? Whenever we have a chance we're there, checking out the local sights and manufacturers. 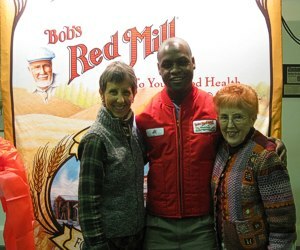 Visiting my mother recently in Portland, Oregon, I had the chance to visit Bob's Red Mill. I've seen Bob's smiling face and his red coat for years on the packages of numerous products adorning the grocers shelves. Wow! they are an amazing company: well integrated at every level and conscious through and through. I got to meet Bob himself, red vest and all. He was entertaining the U.S. Grain Inspectors the day Mom and I visited, and we toured around with grain moguls from around the country. Most of them were narrow traditionalists, so all the teff, amaranth, chia, and other ancient grains overwhelmed them. Why so may products? Do people actually want them? These guys had a lot to learn and I was pleased to see they had reached out to Bob and were there to find out all they could. On the left you see the grain storage. The sheer size of the Bob's Red Mill operation was awesome. 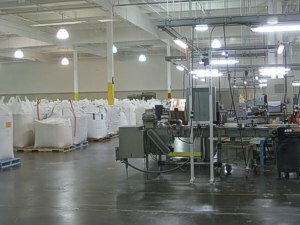 The world's foremost provider of whole grain foods, their facility is on 17 acres just outside Portland. They process over 57 truckloads a day of speciality grain products purchased from contract farmers all across the US. This contractual relationship with farmers is essential to guarantee that every product bearing the organic label truly is organic and not genetically modified. Bob's Red Mill products are now available in 71 countries and the company is now employee owned. Yep, on his 79 birthday last year, Bob gave his company to his employees. While at the Mill with Bob and friends I learned some interesting tidbits. Only six grains contain gluten: barley, kamut, rye, spelt, triticale, and, of course, wheat. All others are gluten free. They can, however, easily come in contact with one of these gluten-bearing grains during processing, which can be a problem. We'll go back to the same thing we say about everything -- Know your sources! Buy organic! 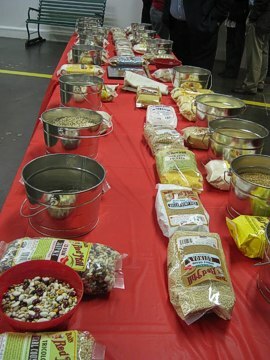 Bob's produces more than 200 speciality grain products, over 70 of them guaranteed gluten free -- they have a special milling room just for these products -- Bob's is worth checking repeatedly for healthy ingredients. One of our most favorite new finds from Bob's, discovered while at the mill, is his Gluten Free Mighty Tasty Hot Cereal. Reminds Mike and me of those country grits we grew up with in Texas. Makes my mother proud to think we're going back to our roots. Bob has been discreetly changing the habits of millions of customers over the years by offering a product line of more than 70 gluten free products. They publish a 'gluten-free newsletter' and yes, I've signed up. Their biggest seller is Flax seed meal -- approaching ten million pounds annually. I'm not much of a grain eater these days, because grains don't seem to agree with my digestion. When I do buy grains, I always buy Bob's. It's nice to find out that my hunch was correct, and it's a great company. I love supporting companies that are conscious, take care of their employees, maintain a positive relationship with their communities, and care about educating others to the importance of farming sustainably with products that are healthy for us in the long run. Bravo Bob! Congratulations to Bob for publishing his biography, People over Profits. Having met the man and been impressed by his personal sincerity, knowledge, and success, I've purchased my copy. 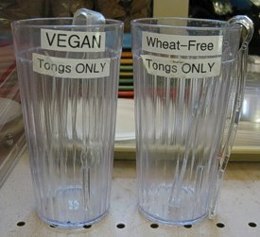 They are amazing -- even separate tongs for vegan and wheat free baked goods in the bakery.